My family loves fried chicken wings. But I don’t like to fry. Pan fry, maybe but Deep Fry – not so much. I love this recipe because the chicken wings get nice & crispy in the oven and I don’t have to slave over hot popping oil in a frying pan. Not to mention, these are so much healthier than any fried wing out there. Preheat the oven to 425 degrees F and line a baking sheet with 1-inch sides with aluminum foil. Be sure wings are thawed and dry them well with paper towels. While the wings are baking, in a large skillet, combine the remaining ingredients set over medium-high heat, except the sesame seeds and parsley. Bring to a boil, stirring occasionally, until the sugar is dissolved and the liquid has reduced to a syrup, 7 to 8 minutes. Remove from the heat and cover to keep warm until ready to use. Place the wings in a large bowl. Drizzle half the prepared sauce over the wings, reserving the other half, tossing to coat well. Sprinkle half of the sesame seeds over the wings and toss again. Place a wire cooling rack inside a large baking sheet lined with aluminum foil and arrange the coated wings on top of the rack. Return the pan to the oven and bake an additional 15 to 20 minutes, or until cooked through and crispy. 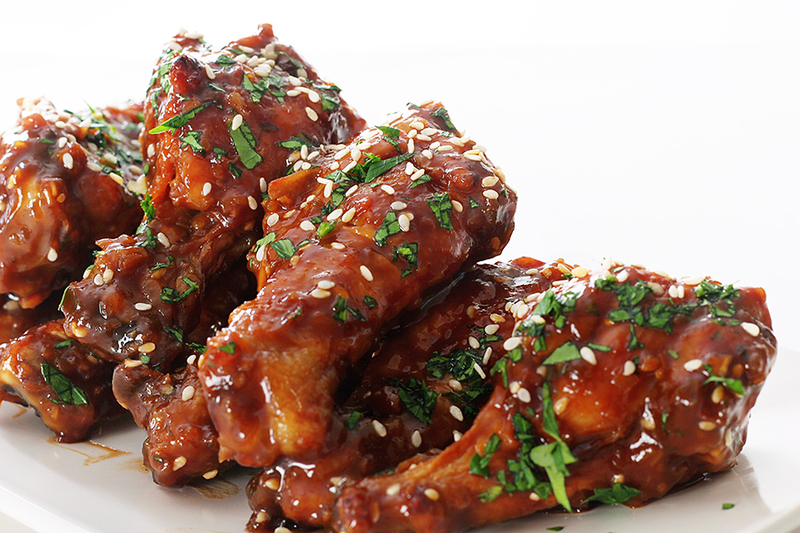 Arrange the wings on a large serving platter and top with parsley and remaining sesame seeds. Serve immediately with the remaining sauce passed on the side for dipping.